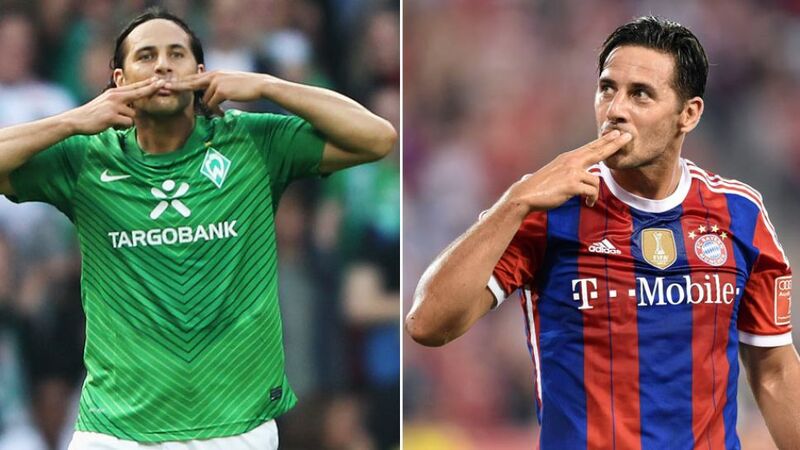 As the highest-scoring foreigner of all time in the Bundesliga, Claudio Pizarro has a special place in the hearts of both Bremen and Bayern. Claudio Pizarro is not only the man of the moment in Bremen, but the whole of the Bundesliga is talking about the veteran forward, who has scored more goals than anybody else since the turn of the year. Already the Bundesliga's all-time top foreign goalscorer, the 37-year-old continues to add to his tally of 187 top-flight goals, and pull his club away from relegation danger. bundesliga.com caught up with the prolific Peruvian to discover what his secret is, while looking ahead to his Matchday 26 return to FC Bayern München. bundesliga.com: 100 goals for Werder [after the 4-1 win over Hannover 96], 87 for Bayern – which club takes up the biggest place in your heart? Claudio Pizarro: Of course I have to say Werder, because I'm back with them now. Next weekend's game's going to be a special one for me, of course, but I definitely want to beat Bayern. We're definitely going to try to do that, even though it won't be easy. Bayern are in good form right now and we're without two key players [Clemens Fritz and Zlatko Junuzovic] due to suspension, but we're still in good form ourselves and I think we're going to give them a good game. bundesliga.com: How do things now look in the relegation battle? Is it a bit more relaxing? Pizarro: Yes. We talked about it a lot this week, but I think we can now take a bit of a breath and be more relaxed about our work. That means we can also focus fully on preparing for the Bayern game. bundesliga.com: You're still at peak fitness at the age of 37, and it shows. Have you made any nutritional changes? Pizarro: I am eating a bit differently to before. I'm avoiding a few things and I did a few tests with a doctor in Italy and that helped me a lot. I'm not eating sweets anymore (smiles). Then there's potatoes and tomatoes, for example. They're all foods which are not very good for me because I'm a bit intolerant to them very well. I'm not really doing anything in particular – I'm eating pretty normally, I just leave out a few things that are not so good for me. bundesliga.com: And what about pizza? Pizarro: I have to avoid that too (grins). But I didn't eat too much pizza in the past either.